Why Would I Want to Use a Jeans Foot? One of my all-time favorite presser feet is my Jeans Foot #8, especially when I’m working with denim, canvas, and home dec fabrics. Like my edgestitch foot, it spends most of it’s time in the little basket by my machine rather than tucked neatly into it’s place in my tackle box. I’m in awe of the engineering that went into the design of this foot. Designed for use with Jeans needles, the back of the needle slot is shaped to counter needle deflection and prevent breakage. Jeans needles are extra-strong so they can pierce denim and other tough fabric, which also makes them a bit more brittle that other needles; if it starts to bend backward, the jeans foot “catches” the end and helps keep the needle from breaking. That’s what makes it so awesome for stitching slipcovers, seat cushions, pillows, jeans, tarps, and other tough fabric projects. Here’s a video demonstrating how Jeans Foot #8 works, as well as Jeans Foot #8D with dual feed engaged. Don’t have the Jeans Foot #8 yet? 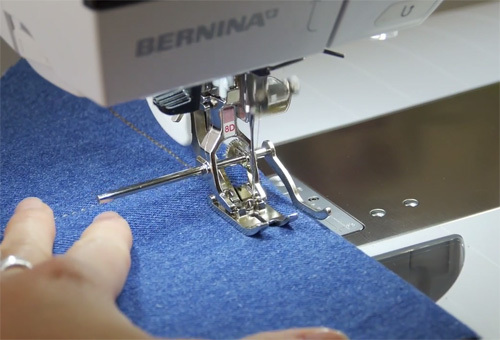 Visit your local BERNINA store for a test drive!